Lock in a great price for Best Western Ft. Walton Beachfront – rated 8.9 by recent guests! Staff was amazing. Extremely helpful. Always smiling. This place was ADORABLE! The staff was super friendly, we even met some nice locals at the swizzle stick lounge. Bed was comfy and the breakfast was great, with different things offered everyday. The breakfast was really good, the bar at the poolside was a nice touch Don was a welcoming guy. Beautiful beach. Continental breakfast was great. Very quiet and clean. Friendly staff. The room was clean and the sheets smelled very clean of bleach. The view from our balcony was very beautiful and breathtaking! The complimentary breakfast was wonderful. Bed was comfortable. Staff was friendly and curtious. Will definitely recommend them. It was very clean and staff was great! The beach attendant even recommended great restaurants in the area. I loved how close we were to the beach. We had a balcony room with a great view of the beach and ocean. The breakfast was very good and offered a variety of choices. Our stay was great! We were right on top of the beach! I loved the kitschy pastel retro design. The hotel provides 2 beach chairs and an umbrella for guests, so we didn't have to unload our chairs from the car. It was a great hotel! The hotel was clean. The beds were comfortable. The bathroom was large enough for two people to be in at once. Perfect location! Right on the beach. Beautiful view and seen lots of dolphins! Staff was super friendly and accommodating ! Best Western Ft. Walton Beachfront This rating is a reflection of how the property compares to the industry standard when it comes to price, facilities and services available. It's based on a self-evaluation by the property. Use this rating to help choose your stay! One of our top picks in Fort Walton Beach.Located on the Gulf of Mexico coast, this Fort Walton hotel is 1 mi from the Gulfarium Aquarium and 0.6 mi from the Emerald Coast Convention Center. 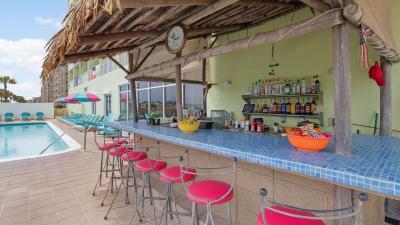 It features an outdoor pool, private beach area, and free hot breakfast. The Best Western Ft. Walton Beachfront offers rooms equipped with WiFi, wired internet, and a 40-inch flat-screen cable TV with the HBO channel. A microwave and refrigerator are provided. The Public Fishing Pier and a variety of seafood restaurants are 15 minutes' walk from the Best Western Ft. Walton Beachfront. Big Kahuna's Water Park is less than 15 minutes' drive from the property. This property also has one of the top-rated locations in Fort Walton Beach! Guests are happier about it compared to other properties in the area. When would you like to stay at Best Western Ft. Walton Beachfront? This room has a microwave, refrigerator and cable TV. This room has a microwave, refrigerator, and cable TV as well as a beachfront view. This suite has a microwave, refrigerator, and cable TV as well as a beachfront view. This inland room has a microwave, refrigerator, and cable TV as well as a roll-in shower. 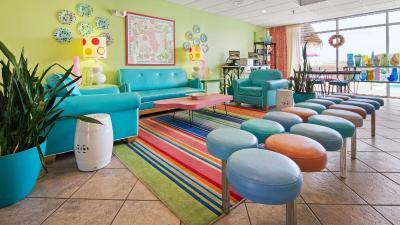 House Rules Best Western Ft. Walton Beachfront takes special requests – add in the next step! Best Western Ft. Walton Beachfront accepts these cards and reserves the right to temporarily hold an amount prior to arrival. The bed was very hard. Almost as if it hasn't been replaced since it was built. I'm not one to expect top of the line from a mid range hotel but this was definitely below expectations. I could feel all the coils and how uneven it was from how worn out it was. I'd wake up with a back ache. The hot water kept running out before my husband could take his shower. We chose and paid higher rate for a jaccuzzi tub, but the fact that hot water would run out didn't let us enjoy it. I liked the view and quick beach walking distance. Also loved that pool was heated (sesonal) since it was on the cooler side while we were there. It’s not on destin beach. But there are chairs included here for the beach and our room looked right over the ocean. It’s only a 9 minute drive to destin. Breakfast area is easily congested. The hotel needs to be updated, that being said it was still extraordinarily clean. It was clean and the staff was great. Our toilet would not flush without several attempts. Eventually, it overflowed at one point but maintenance came quickly to address the issue; however, the water went down by itself while waiting. It was unfortunate and gross that housekeeping was not sent to mop the floors when we asked if they were going to clean the water up off the floor. He wiped it up with some towels. Breakfast was a fiasco. Constantly running out and few places to sit. No fresh fruit unless you peel it yourself. Rooms are clean but tired for the cost. Without the superb location this hotel would be worth half as much but the staff were good. Views and location and bars were good fun. Maybe more than one set of washer n dryers? One more set would be great!